This cordless trimmer has been especially designed for trimming the heads, legs, belly and the tail of dogs. It is a very quiet trimmer, with low vibrations, ideal for nervous animals. It comes with an adjustable blade that can cut hair from 0.5mm to 2.5mm. It also comes with 5 snap on combs in 4, 8, 12, 16 and 20mm cutting lengths. The cordless trimmer provides up to 100 minutes of clipping time, and the battery re-charges in 60 minutes It can also tun directly from the Mains. 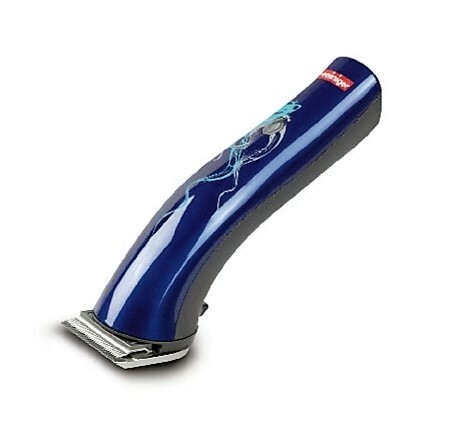 The trimmer is very light, at only 240g and is ergonomically designed for comfort. It is made in Switzerland and comes with a 2 year guarantee.